Over the past little while, Torontoist has been quietly absorbed in The Alphabet Game: a bpNichol reader. 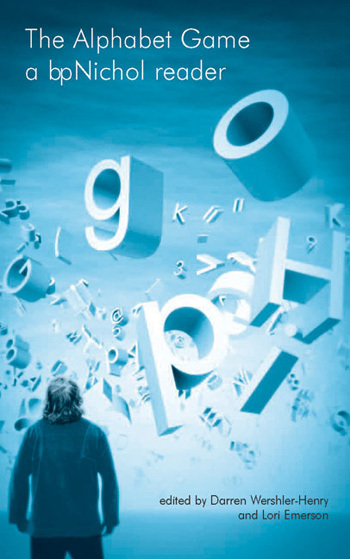 Edited by Darren Wershler-Henry and Lori Emerson, The Alphabet Game is an essential anthology for any reader of bpNichol, and is a great starting point for those who have yet to discover his work. Nichol, who is probably most well-known for his concrete and visual poetry, had achieved many things before dying at the age of 44. He was a member of the sound-poetry group, The Four Horsemen; a writer for Fraggle Rock; a recipient of the Governor General’s Award; and the subject of Michael Ondaatje’s documentary, Sons of Captain Poetry. The very first poem you will encounter is entitled “The Complete Works,” which is possibly the best summation of who Nichol is and what he does. His concrete and visual poems are often playful, inhabiting a ‘pataphysical realm of existence full of linguistic orgies, turning the mundane into magic and keeping absurdities absurd. Nichol’s work often invites you to reconsider the most simplest of landscapes, images, ideas, and/or objects, and to appreciate the underlying humour that would otherwise be unrealized. The organization of Nichol’s works in this book is flawless. One concrete poem will drag you into the next, then suddenly you will find yourself standing in a visual poem, and then before you know it you will find yourself reading excerpts from the Martyrology. Reading this book is a seamless effort, both Darren Wershler-Henry and Lori Emerson—who has also archived Nichol’s sound poetry at PennSound—must be commended on their work. Long time readers of Nichol will greatly appreciate this new addition to their library, and for those of you who have yet to read him, The Alphabet Game is a good place to start. This is a book of potential trajectories concerning Nichol’s work, a compass just beginning to point you into the right direction. The Alphabet Game includes excerpts from Aleph Unit, The Martyrology, Zygal, Translating Translating Apollinaire, and many others. The Alphabet Game: a bpNichol reader is available through Coach House Books for $21.95. Image courtesy of Coach House Books.